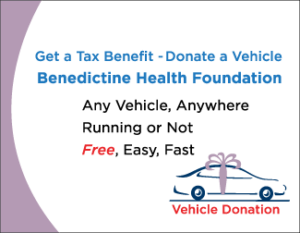 You can help provide compassionate care in Ulster County by donating your car, truck, motorcycle or recreational vehicle to the Benedictine Health Foundation. Donating a vehicle is easy. We provide free towing. You receive a tax deduction. The proceeds from the sale of your vehicle fund programs that inspire hope and empower people facing a cancer diagnosis, or behavioral health and substance abuse challenges. Agents from our vehicle donation partner, Vehicle Donation to Any Charity (V-DAC), will answer your questions and arrange a convenient time to tow your vehicle.